If you notice any of these signs of foundation failure, contact the professionals at Atlas Piers of Atlanta. Cracks in your concrete is another sign of serious problems including foundation damage, erosion, or drainage problems. Get an inspection of your cracked concrete by the experts at Atlas Piers of Atlanta. We will be able to see what the problem is, if any, and offer the best solution for your concrete repair or foundation repair needs. Foundation and concrete problems in North Carolina are usually caused by the shifting of the soil beneath the foundation and concrete. When the soil gets saturated, it swells and when it is too dry, it shrinks. This continues shifting of the soil also causes your foundation and crete to shift. 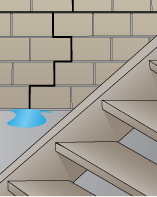 This shifting occurs at different times in different locations of your foundation. This is how the foundation and concrete becomes damaged. Atlas Piers has been serving North Carolina with quality work you can count on. Our coverage area is continuously expanding. We are proud to serve you for all the foundation repair needs in North Carolina. If you need service and do not see your city listed, please contact us, we may have already expanded into your area. Helical piers are an excellent choice for foundation repair and stabilization when light structural loads, unstable rock basements or very deep load bearing layers are present. These helical piers are driven deep into the earth through unstable soil until they reach solid soil. Then the structure is transferred onto the piers to stabilize and level the structure. Steel push piers are used to support and stabilize your home or business’ load bearing walls by transferring the weight of the structure from weaker soils onto the steell piers that have been driven deep to load bearing soils. Helical tiebacks are designed to stabilize and strengthen bowing walls. These helical tiebacks are installed from inside the basement wall through a small hole and then with exterior excavation, the walls can be immediately pulled back to its original level. Porch piers are used if you have a porch that has pulled away from the home or is sinking and unlevel. The foundation along the front edge of the porch may lack the proper support and begin to tilt. Porch piers are installed to get your porch back to its original level and permanently support the porch. Slab piers are similar to helical piers, except they have a bracket to support heavy concrete. They are an excellent choice and more cost effective than replacing a slab. Installing slab piers does not require heavy equipment. All of the products that we use for foundation repair or concrete repair are manufactured by Earth Contact Products (ECP), the leader in foundation repair products made in the industry. Other problems associated with a damp or wet crawlspace is wood rot, pests and insect infiltration, high humidity in your home, damp floors and walls, and sagging floors in living area. 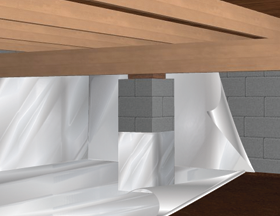 Atlas Piers of Atlanta can help with your dame or wet crawlspace by crawlspace encapsulation with a vapor barrier. This vapor barrier will encase the walls of the crawlspace, keeping moisture from entering. The vapor barrier we use is made by ECP and is 10-mil thick or 16-mil thick and is puncture resistant. Your local hardware store may carry a thin plastic sheeting for crawlspace encapsulation, but these are usually only 6-mil thick and are not puncture resistant. Once the material gets even a small hole, the material will completely lose its effectiveness. Not only will crawlspace encapsulation keep your crawlspace dry, you will also save money on energy bills. The vapor barrier acts as an insulation, keeping it warmer in the winter and cooling in the summer. If you are in need of crawlspace encapsulation, contact the experts at Atlas Piers of Atlanta. We have the experience and use the best products to keep your crawlspace dry in your North Carolina home or business. Call us today to schedule an appointment. We want to help you with all your foundation repair, concrete repair, or crawlspace repair needs in North Carolina.